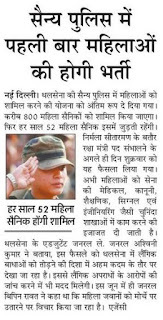 Indian Army said to decrease gender barrier we are going to recruit 800 Women in Military Police and 52 every year selected. Senior Official said recruitment of these woman personal will be placed in border of Pakistan under security challenges where women mass of stone palters every day happen. 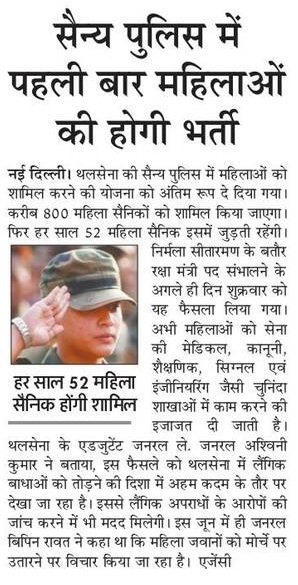 Those women who got select will undergo 42 weeks of training at the Corps of Military Police training centre, Bengaluru. Qualification : Should have must possess Post graduate degree/ diploma holders in any Stream. Application fee: Rs 200/- will be charged from the applicants towards application processing. Selection Procedure: The candidates will be selected on the basis of SSB Interviews, Psychological Aptitude Test.